I am considering one of these as an alternative to the Merc CLA 45 which i've decided is out of budget as I don't want to spend more than £20k. All i've heard in recent years is issues with BMW's such as VANOS or DPF etc so are the recent BMW's any better? Looking at either a 2015 or 2016 F30 model. Is the x-drive specific on tyres and wheel sizes so only keep to original BMW wheels and not aftermarket alloys? I've seen a dealer that sells a lot of these models but fits their own bodykit and wheels - they look stunning in the photos but wonder just what the quality will really be like - i'm assuming utter cack. Anyone had the F30 and can say what their experience of it was? Last edited by An0n0m0us; 04 February 2019 at 04:13 PM. Not sure of the models but my old man had the 2016 335d GT xdrive on lease. Re-map is supposedly more of the same but even at stock power with the "M-Sport" brakes it sure didn't wanna stop. You will not see the quoted MPG figures, but I doubt you are buying a 335d for fuel economy?? I can't give a direct comparison, I own the bigger, heavier 530d (F11) I can barely squeeze 40 from it on a long run, and driving like I am trying to save the planet! Under normal real world conditions low 30's is more realistic. I would be notching 30% out of any quoted manufacturers figures for derv cars, if you can't live with that as a running cost at the miles you intend to cover, its maybe not the right car for you. The throttle response / suspension / steering weight is adjustable between economy, comfort and sport modes - economy and comfort are like driving a car with a fault, you press the pedal the revs don't climb as quickly as they should, and the car is slow out of junctions or onto roundabouts - its is downright dangerous in my opinion. Sport mode is where you will be at, to make the thing drive like the car your have just paid for, and therefore the MPG plummets. I would research the facts about tyres really carefully - have heard a lot about having to change all 4 tyres at one time, and some 'types' of tyres damaging the x-drive system. Could be internet BS, could be fact, I would check carefully. The six is the correct number of cylinders for the derv models, and mated to the 8speed ZF gearbox it is just brilliant (sole reason for buying mine over an E-class and A6), it is always in the right gear, and changes up and down are seamless and so smooth. I can't say more than that as I am not comparing like with like. Last edited by tarmac terror; 04 February 2019 at 05:48 PM. TT no the quoted figures aren't essential as long as I see minimum 30mpg I just want great performance with decent running costs which the Germans are starting to excel at with Mercedes and BMW's recent models. I'm doubting the suitability of a diesel though because of the short journeys I do which will knacker the dpf on the 335d so I may have to stick with petrol. I really want the CLA45 but out of budget for a 2nd car and I won't sell my main car for anything. Other option in an M240i but ideally I wanted 5 door/5 seats and I don't like the M140i shape. The 3 series petrol ramp up on running costs so they are out. The M240i might be the best option at the moment unless I can find another £5k minimum for the CLA. I wouldn't be put off by the DPF stories - my car does a 6 mile round trip each morning from cold to take the kids to school, repeat this again mid afternoon 5 days a week (I work from home). The same thing recurs on a Tuesday night and Friday night as the kids go to GB / BB respectively. The car gets a decent round trip run on a weekend of around 50 - 60 miles with me driving, and the DPF looks after itself. I was told not getting the engine temp above 70 degrees, and not doing a long run at least once a fortnight will cause DPF problems. I disabled the stop start thing to help with this, although the school run isn't at all stop start driving as I live in the sticks. Cheers TT that's good to hear. I had a DPF issue with my Pathfinder and did what it said in the manual to burn it off (basically take if for a blast for half an hour) and it worked a treat. If the BMWs can have their DPF sorted just as easily then not such a worry. I live in the sticks too and regularly do a 1 mile trip round to see my children and currently have a Fiesta ST3 which I use for running about and don't get any issues with it being petrol. The 335d would be to replace this and get a good long run once a week. I work from home too so no daily commute to give it a daily run. I was told not getting the engine temp above 70 degrees, and not doing a long run at least once a fortnight will cause DPF problems. I disabled the stop start thing to help with this, although the school run isn't at all stop start driving as I live in the sticks. The 70degree thing is a relic of a issue with the E60 and E90 models that would not regen below 70degrees, of which were very prone to thermostats sticking open. Resulting in clogged DPFs.They were worse were given ‘a run’ as the faster the car went the colder the engine was. I seen these with stuck open ‘stats that would not regen on the motorway but would regen in 25-30mph city driving as the there was less airflow through the radiator...the exact reverse of what the ‘experts’ tell you to do (drive down the motorway). The ‘F’ model BMWs do not have this issue...they regen pretty much from cold. You will know as the cooling fan kicks in on full pelt with a cold engine and the A/C is turned off (therefore no other reason for the fan to run). As such unless there is a fault or a ash issue, they don’t have any problems. Ash accumulation and Check engine lights or logged fault codes related to emissions control faults (EGR, oxygen sensor etc.) are the main reasons for DPF issues on the newer BMWs. Indeed, our F07 535d is frequently doing regens (every 50miles or so..should be 300-500miles)...it has a swirl flap position issue (sticking) and has 95K on it. I suspect the swirl flaps are causing it to produce more soot than usual and 90k would usually mean at least 50% of the filter will be full of ash which is impossible to remove, on older cars it could be removed and cleaned, but these ones are part of the catalyst so you can never remove all of the ash as the cat is in the way, regardless of what ‘dpf cleaning’ companies may claim (although loose ash can be blown out, the hardened ‘tubes’ of ash that form in the monolith have no way of being removed). Last edited by ALi-B; 07 February 2019 at 09:33 PM. Interesting Ali - what is the reason for the cooling fan going at full steam? I booked mine in for the EGR recall which is current - was asked if there were any signs of EGR failing. There are no symptoms, however I mentioned to the service manger that my car makes a noise when I have shut it down and locked it, which sounds like a dial up modem. You can only hear it if you stand next to the car for a bit, and only happens if the car has been on a decent run. I have put the car in the garage, and it has done this for almost 3 hours. When I mentioned it to the service manager yesterday, he said that is normal and is probably the DPF cleaning itself!! Surely the DPF can't carry out any form of maintenance without the engine running? You ever encountered that type of noise - I can only imagine it is pressure venting from something or being equalised in something, but stuffed if I can work it out, there are no recorded fault codes, and I can't detect anything that indicates a leak. Any thoughts??? The fan runs to keep the engine bay cool as during regen the dpf gets up to 600degreeswhich is about twice as hot as normal. If the engine is shut off before completion the fan will carry on running for about five minutes. And yes, the engine has to run for the DPF to ‘clean’ so whatever that service manager was chuntering on about is nonsensical. The buzzing noises under the bonnet are usually the throttle body, EGR or swirl flap motors staying active, they are servo motors that use pulse width modulation (PWM) to control their speed and positioning, its this PWM that creates fax/modem noises. They should do a short anti-sieze/self check exercise then shut down. You get that on a lot of cars, but they should all be off five minutes after locking the car. I have encountered E60 BMWs that would not ‘sleep’ if he bonnet switch was faulty or not properly clipped in...F07/10/30 BMs don’t have this switch so shouldn’t do this (I think it’s built into the bonnet catch on the later models). However the hard drive in the sat nav/music storage will run for what seems to be an eternity clicking away behind the dash. Why? Who knows! Thanks Ali - would never have considered the bonnet catch as possibly being in play, the bonnet would always have been up when I have been trying to find the source of this. Ali have you heard or seen of any issues with the x-drive and bigger/different alloys/tyres fitted from the standard BMW ones? 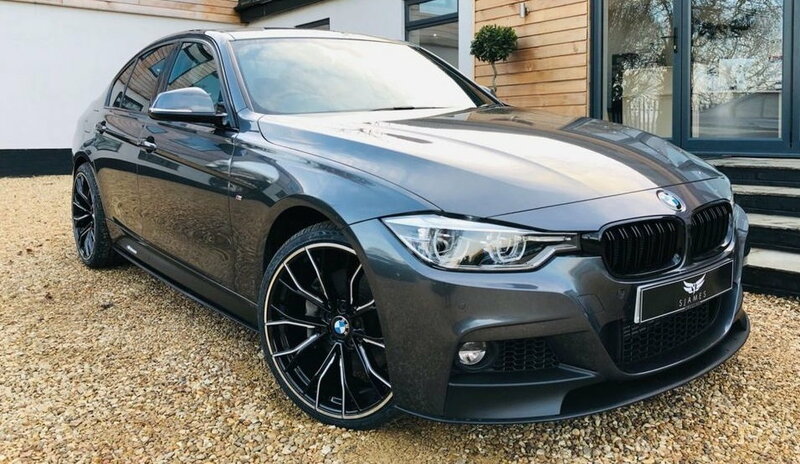 One of the cars i've seen is fitted with aftermarket 20" alloys however BMW do offer their own 20" alloys for the 335d as part of the M-sport range. This is the one but confirmed they are copy(fake!) m-sport wheels and bodykit. The look I love but being cheap aftermarket parts including the wheels puts me right off. Last edited by An0n0m0us; 08 February 2019 at 01:42 PM. Whenever I’ve looked at aftermarket wheels, I’ve often found the replicas whilst being the same size have different offsets. Sometimes its only a few mm, sometimes more. Something else I’ve found is diamond cut wheel faces don’t last in this climate...the slightest chip in the laquer results in white worm as soon as the gritters start chucking salt everywhere. Now interestingly I have an old E39 with genuine forged wheels with polished rims and faces, and despite being curbed do not suffer any corrosion. Pity all wheels now are cast. X-drive seems to be a lottery; My cousin bought a cheap F30 X-drive with over 150k on the clock and its fine. On the other hand I know someone with a same year X3 with just 40k and the transfer box has gone (although I believe that uses a different transfer box to the F30 ). I’ve looked at how these are built (google ATC 35L), and it’s nothing complex..its just a wet plate lock-up clutch actuated by a servo motor, basically it’s a variable diff-lock. The system “should” fully disengage during normal driving but is able to apply a varying amount of lock proactively (i.e when accelerating hard or if wheel slip is detected). Tyre mismatch should not affect these, but obviously not ideal, but no different to any other full-time AWD car in that respect...you should not stick brand new tyres on one axle with 3mm left on the other axle. What appears to happen on some of these is the output shaft splines shear off! Now the only way that happens is a massive over-stress (like doughnuts on dry tarmac), corrosion from water ingress, or excessive movement causing the splines to wear down. None of which has anything to do with tyre size or brand...so long as they are all the same size and roughly same wear. Thanks Ali although I wish I knew more about mechanics as the technical bits went right over my head! When I asked them about the wheels and body kit they openly admitted they were their own make made just for them allegedly and come with 12 months warranty - every BMW they sell has the same wheels and body kit fitted. I want more than 12 months on a set of wheels, doesn't inspire much confidence and makes me think they will crack/corrode after a year's use. On a car dealer review site I looked them up and one customer claimed the tyres looked too small for the wheels with the rims being more exposed than they should be and that on close inspection the body kit is poorly made. Aftermarket bodykits are always a matter of personal taste. Some are better than others, but nearly all of them need a good bodyshop to get them to fit...especially fibreglass copies that will require trimming and filling to get the gaps rights and correct any ripples. Better made kits need less prep work, so something like a genuine Alpina or Hartge kit will always be more desirable than some knock-off fibreglass moulding. I priced up the bodykit and wheels on the BMW website and it's extortionate. The seller of the car above seems to sell a lot of them so you'd think they would have done a good job with the kits and wheels but it's a very long way for me to go and find out. I might post up on bimmerpost and ask if anyone there has viewed/bought from the seller and what they think. BMW 335d. They move dont they! Quick Reply: BMW 335D F30 - what are they like/owner experiences?